…In fact I often spend more time pressing flowers than I do crafting with them afterwards! Here are some flowers I pressed this Spring. This summer, after a few failures pressing flowers using my ad hoc blotting-paper-in-a-scrapbook method, I thought I’d try and put together something more permanent and substantial. 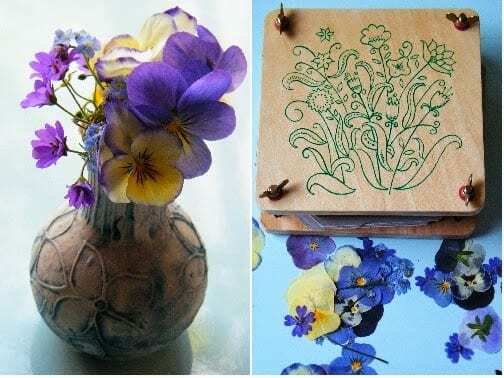 [Incidentally, I have got a normal “kids” flower press – see blog post on pressed flowers last year – but it doesn’t hold enough specimens for my needs anymore]. Unlike the gentleman on YouTube (see bottom of page), I do not have carpentry skills and wingnuts, but my method seems to be working OK so far. As mentioned in my dried flower diary for August, I wanted quite a big press, at least A4 paper size. I confidently went out to the garage thinking I’d find a couple of pieces of wood/hardboard/chipboard to fit the bill, but no such luck. However I did come across a couple of ceramic floor tiles, each about 40cm square, which are satisfyingly heavy. I cut enough blotting paper and card for 5 layers. The cardboard was salvaged from some old unused boxes, but I had to buy the blotting paper. Each layer requires 2 sheets of card and 2 sheets of blotting paper to provide sufficient absorbency. Once I had assembled all the flowers into the press with all the layers sandwiched together (I used all five straight away but I can easily add more), I weighed it down with a 10Kg sack of dried lavender from the workshop and left it for a week. Pressed flowers including lavender, caryopteris and fuchsia. My favourite flower from the batch I pressed this time was caryopteris, because of the range of colours from green and yellow to pink and blue. It reminds me of Ancient Egyptian wall paintings for some reason. I think some pressed flower art is on the cards!